1. Installed the driveshafts, greased the driveshaft splines, pushed into place in the dif and a quick couple of bangs with a rubber hammer. 2. Assembled the de-dion hub assemblies. Fixed the ears to the De-Dion tube, with the driveshaft ends going through the hole, then bolted on the hub. 3. Installed speed sensor. Is it alligned well enough -its a little offset? 5. Then I found a problem, the anti-roll bar connectors were pushed up and out of the way for the above work. When I tried to rotate the down into position, they were bloacked by the De-Dion hubs. 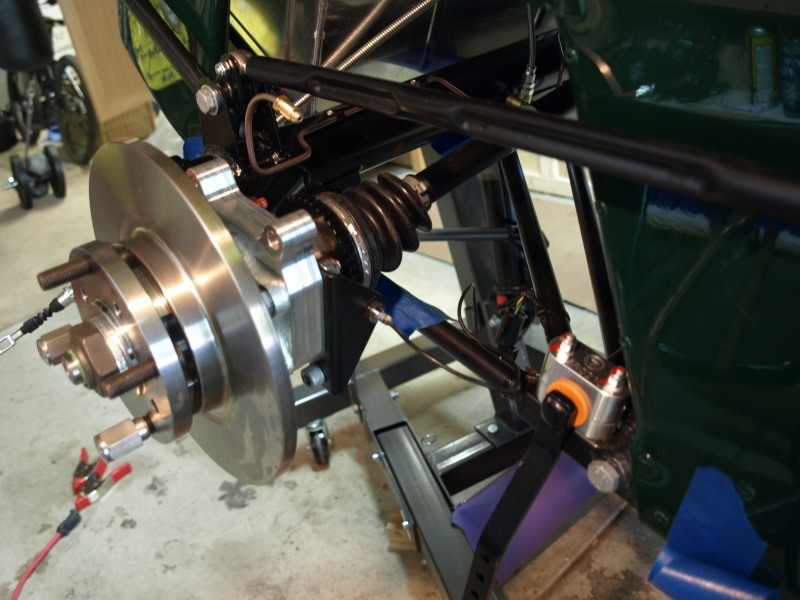 So the de-Dion hubs had to come back off, rotate the anti-roll bar then re-install the hubs. This is the 3rd time I installed them – I was really good and fast by now. 6. 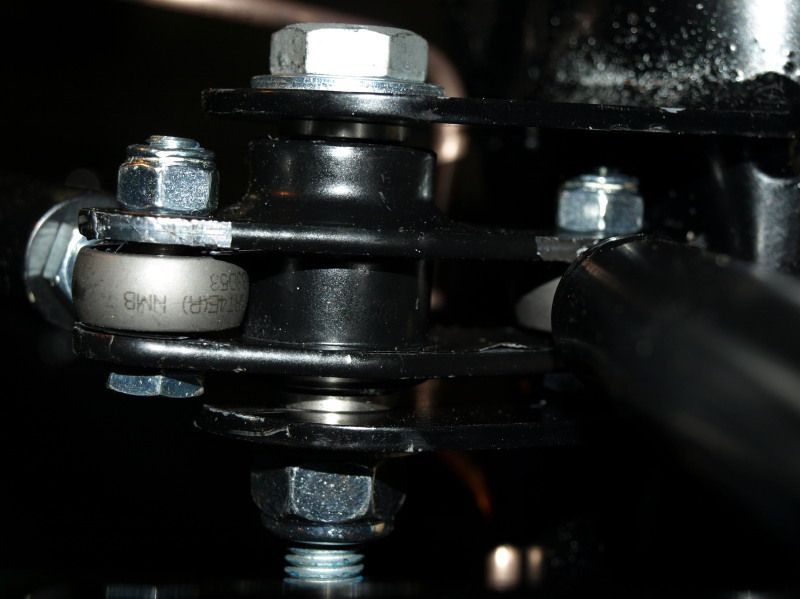 Anti-roll bar connected with drop links (softeast setting for now). 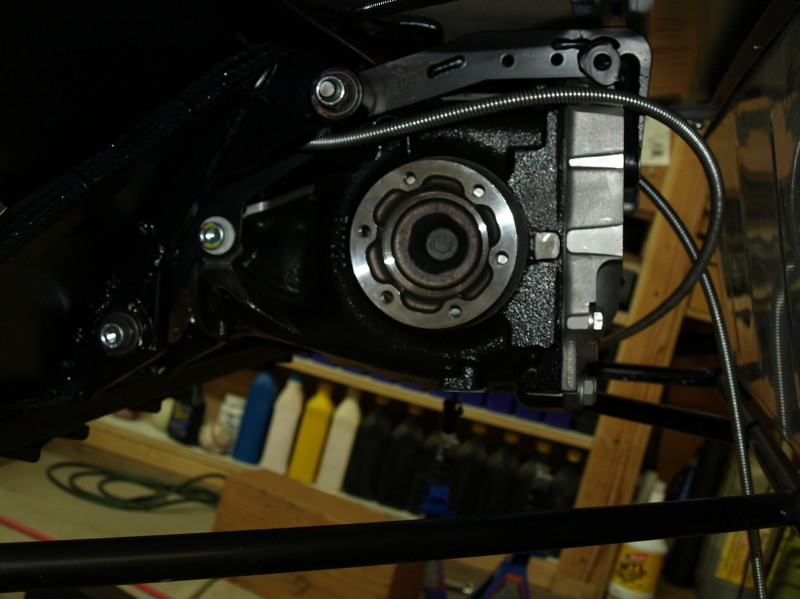 Installed brake calipers & pads & connected handbrake cable to brake assemblies (did not adjust yet). 7. 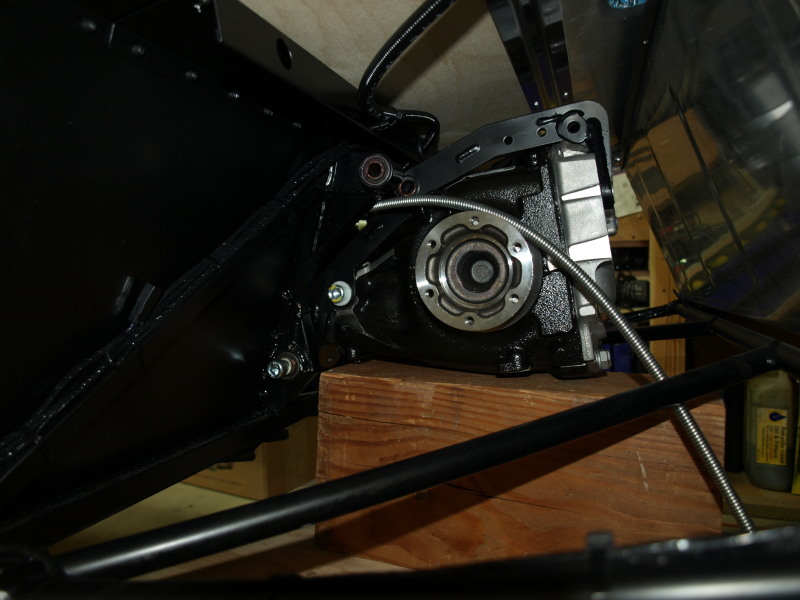 Installed roll-over bar – this has to go in before the rear dampers because access is blocked blocked by the top damper mounting. Had to use a M10 tap to clean out the screw holes in the roll over bar before bolts would go in (too much paint?). 9. 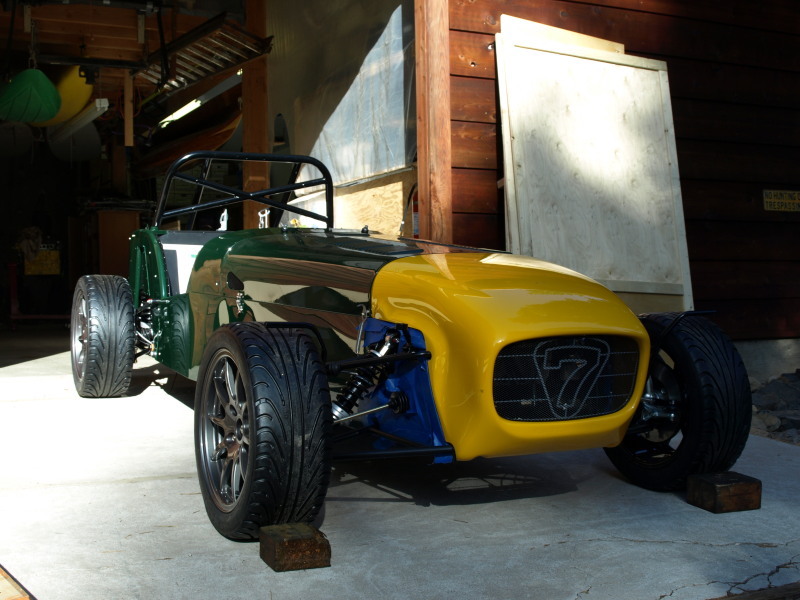 Put on back wheels – now its a roller. 10. Torqued the hub nuts to 270NM (200ft-lbs). Made some good progress today, with a few backward steps on the way. 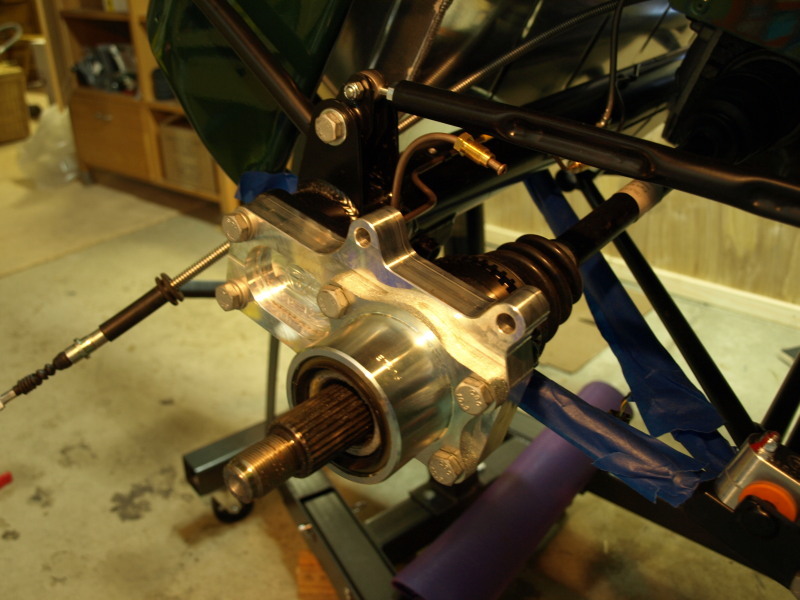 The manual recommends putting in the engine after finishing the front suspension, but as the engine is not ready, I’m going to put in the rear axle and suspension next. 1. Started off by fitting the brake hoses for the front brakes. 2. Then, to the back to get in the differential. 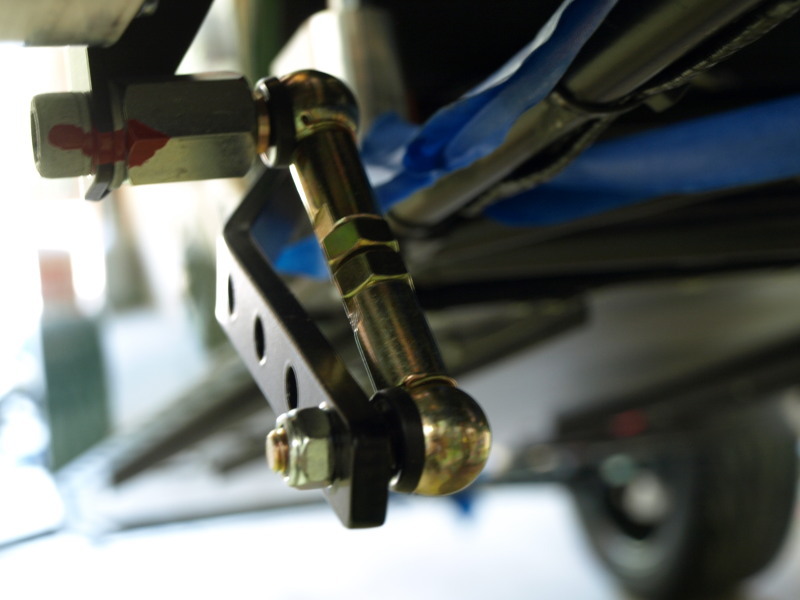 From the blogs I read, I was expecting it to be a major pain – everyone seems to have trouble getting the top long bolt in due to alignment problems. So, being ready for a long day, I did not want to be lying on the floor with 18″ clearance with the car on jack stands. So I took a couple of engine hoist brackets and bolted them to two seat belt fixing holes, then connected up my engine hoist to the back of the car and hoisted. I can get over 3 feet of clearance under the back. 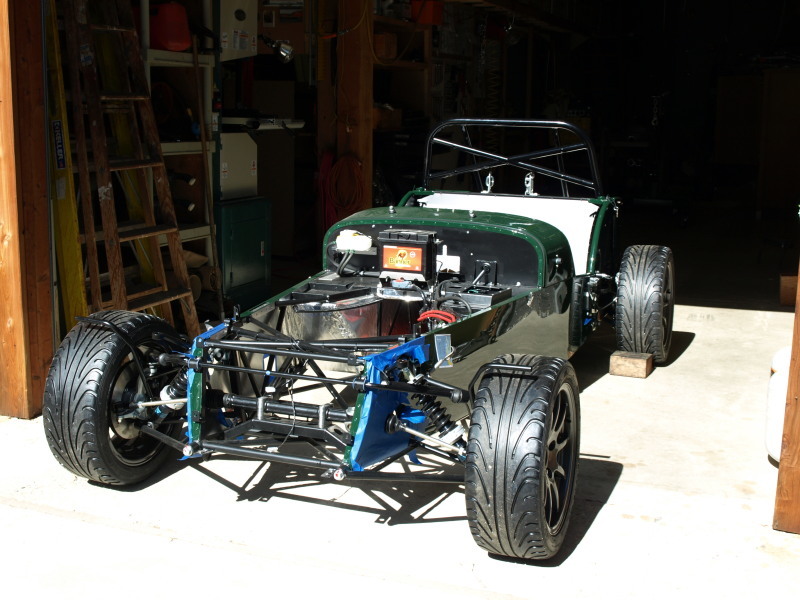 Whats more, with the front wheels on and the engine hoist wheels, I can move the car around. 3. 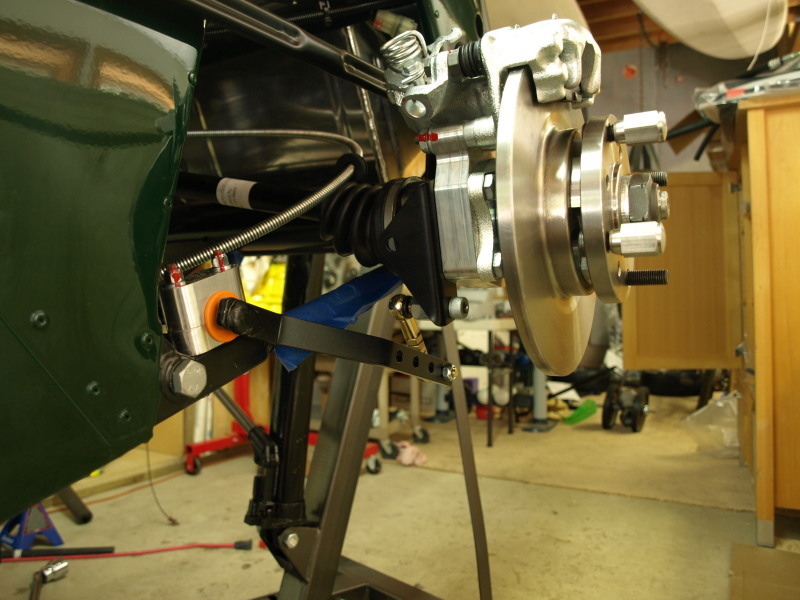 Fitted the handbrake and cable and routed through the rear of the tunnel to where the diff goes. The cables have to be in before the diff otherwise there’s no room later. 4. 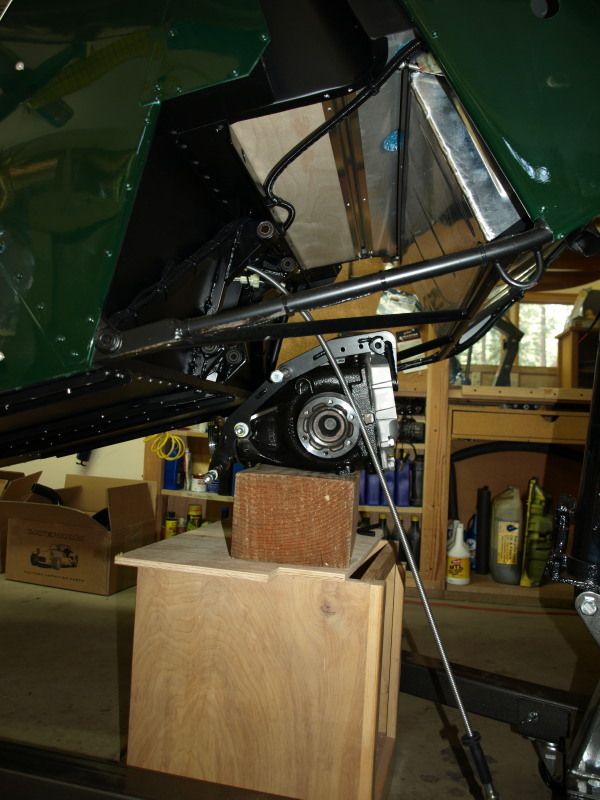 I put a wooden box with additional wooden blocks under the back of the car and set the diff on top. Then lowered the car onto the diff. Got the bottom 2 bolts in easy enough. Used copper-ease grease as recommended. Then continued to lower the car, the diff rotated around and the top holes started to align (this is where I was expecting trouble). 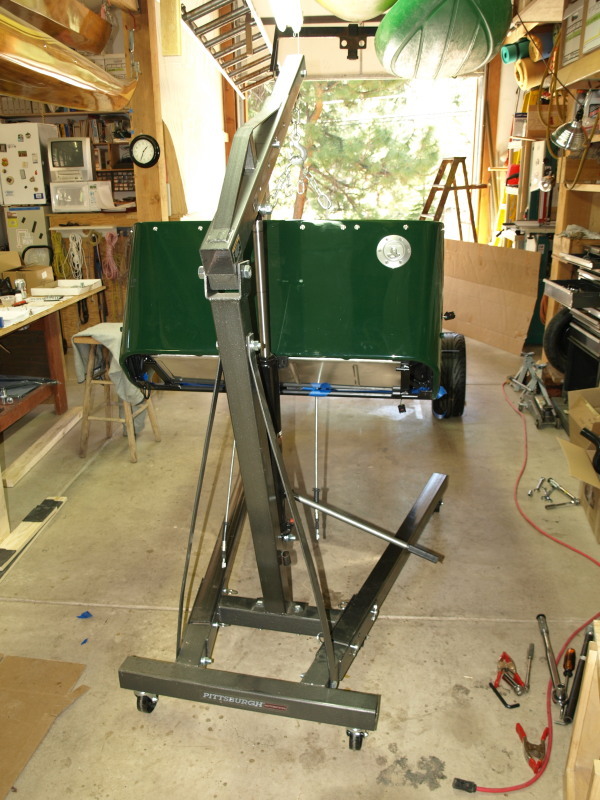 So, the holes aligned and I pushed in the 11″ bolt by hand! Magic – the alignment was perfect. With the top bolt temporarily in place, I aligned the diff to be exactly in the car centerline by adding spacers to the 2 lower bolt fixings. Then tightened up the top bolt and torqued all 3 bolts to spec. Job done…or so I thought. 5. 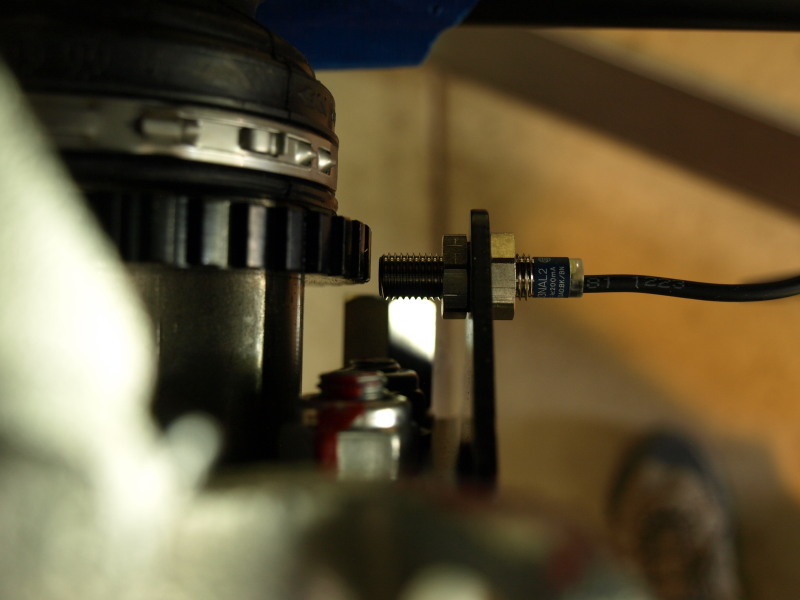 Fitted the handbrake cable into its slot on the side of the diff and adjusted the cable to take up slack. 6. Next, the prop shaft. But there’s no way to get it in from the front of the tunnel because the universal joint that fixes to the diff is bigger than the narrowest part of the tunnel, and no room at the top or bottom. The only way is from the back, and there is a differential in the way. Bummer. 7. 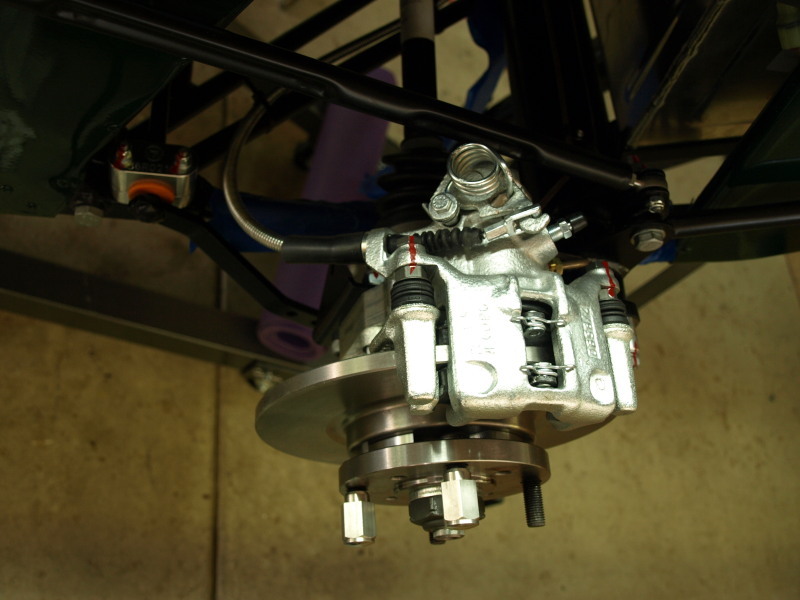 So, back to the diff, slacken the 3 bolts, undo the handbrake cable, take out the 11″ bolt from the top and jack up the car so the diff rotates down 90 degrees and makes enough space to get the prop shaft in. Then put everything back. Bolted and torqued the 4 bolts connecting the prop shaft to the diff. 8. Need to check/fill the diff with oil. The filler cap is a 14mm allen wrench which I don’t have. So, stopped for some lunch, then into town to get a 14mm allen wrench. While I was there, also got socket drive 10mm & 8mm allen wrenches which will help with torquing allen bolts. Also bought 4 spark plugs and ordered a gasket for the camshaft/rocker cover (which should arrive mid next week). 9. Lowered the hoist to level the car, then removed the diff oil filler cap. Had to put a tube inside, with the other end connected to a squeeze bottle of 80w90 synthetic gearbox/diff oil and squeezed…..for quite a while, until oil started dripping out of the hole. Removed the tube & put the cap back in. 10. Next is the de-dion tube. 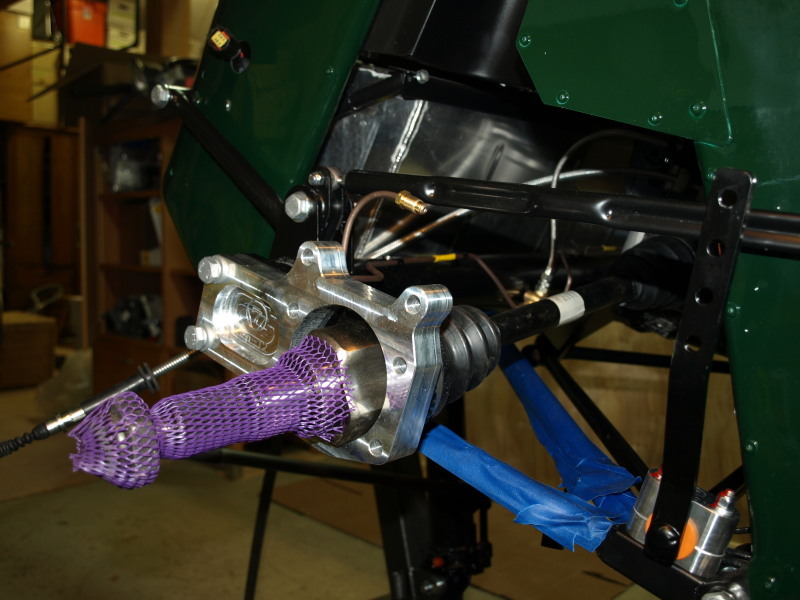 First thing is to fasten on the rear brake fixed pipes onto the tube. Which meant I had to temporarily connect up the de-dion ears, hubs and brakes on the bench. Which was a good exercise to see where everything goes before getting under the car. So connected the pipes to the brakes and riveted the pipes to the de-dion tube. Then took it all apart (except the pipes). 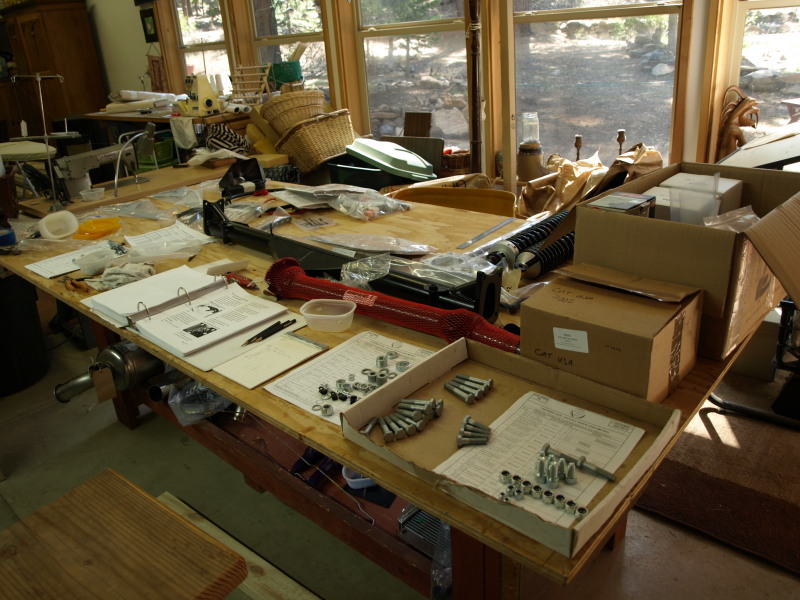 Picture shows all the rear suspension parts on my bench. 11. Placed the de-dion tube into/under the back of the car. 12. Now to assemble the Watts linkage. This was a struggle. 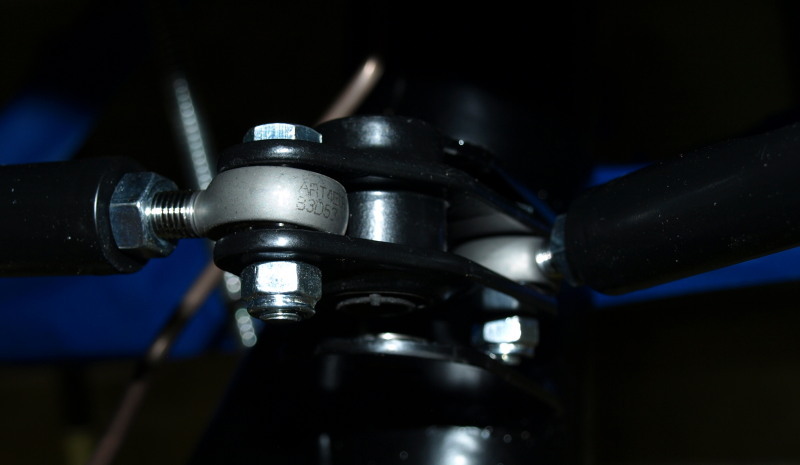 Fitted the Watts link rod ends and adjusted to the spec length (4 in all, 2 short & 2 long). Then connected a sort and a long Watts link to a common bell-crank -which needed brute force & bending until half the coating came off the bell-crank. Made up the other one and bolted these assemblies to each side of the car. 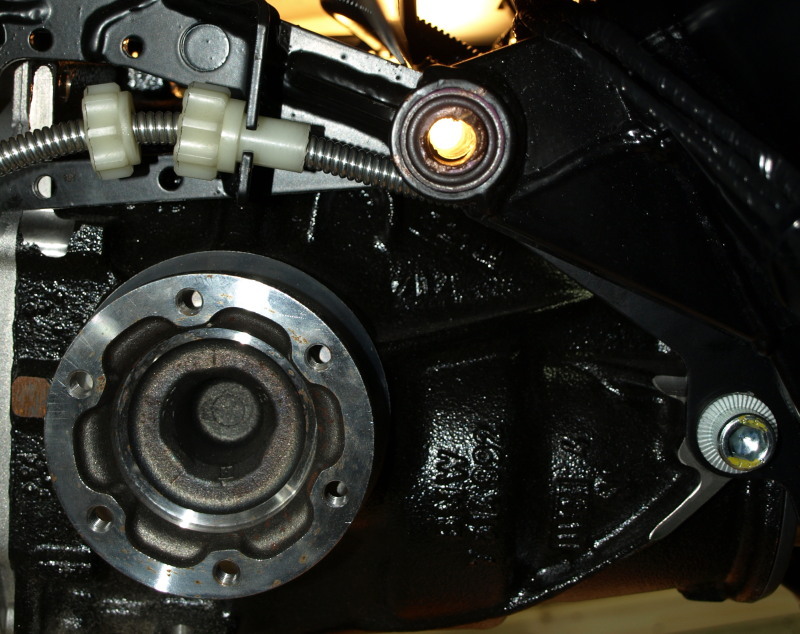 This first picture shows how I had originally installed the Watts link ends to the bellcrank, this did not givr enough clearance when trying to install onto theDe-Dion tube – the nylock nuts were sticking out too far. In the second picture, I have turned around the bellcrank, which allows more space for the nylocks. 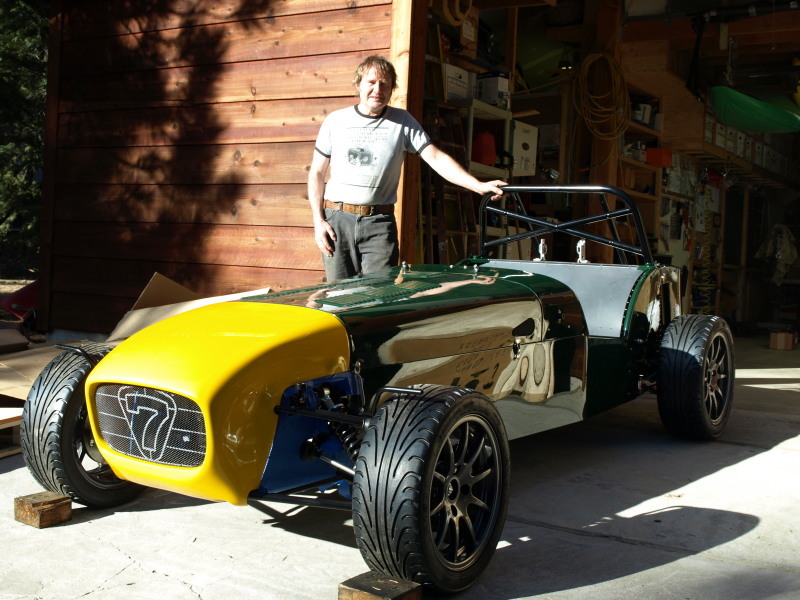 Bolted the bellcrank onto the De-Dion tube – no trouble this time. 13. Connected the A-frame to the De-Dion tube and then made the forward connections to the chassis. 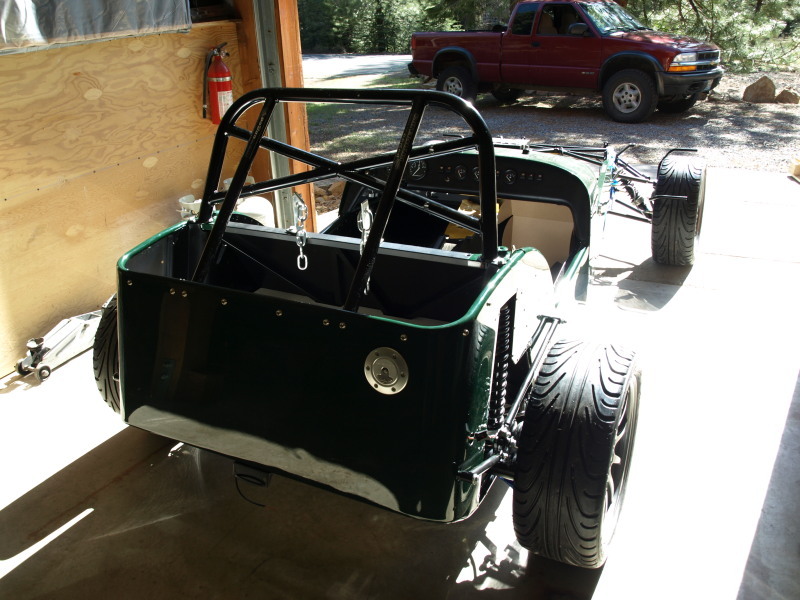 then added spacers to get even spacing on the De-dion ends -to-chassis on both sides of the car. Must have fitted & un-did & re-fitted 5 or 6 times until the 2 sides measurements matched within 1/32″. 14. Anti-roll bar was next. I had to pull/push on the rubber mountings, lots of stretching using a screwdriver and rubber lubricant to get around the corner . Other than that it went in fairly easy. 15. Last thing today was to remove the existing hubs from the diff. A heavy piece of iron was employed as a pry–bar and the came out without too much trouble. At this point it was 10:30pm and I was done for the night.